It’s a weekend long celebration of gaming and getting together with friends and making new ones. PAX is the one event every year that I’ll put almost everything else on hold to attend. In the past eight years of PAX, I’ve only missed once when my daughter had surgery (a few years ago, she’s doing pretty well now). I’ve seen the invention of the Magic Party, its evolution, to its final iteration last year. Now, Magic takes over an entire theater for a weekend. I was one of the only people posting spoilers online in the first Magic Party on Zendikar (the first time around) to Twitter and now the multinational company is streaming high quality shows on Twitch dedicated to introducing cards and mechanics from the very people who designed them. Every year WotC tries to go bigger and grander. Last year it was a section of the Convention Center that had a huge Eldrazi arm breaking through a window and smashing a car. It was pretty epic. This year WotC took over an entire building and threw a street fair (Inventor’s Fair) with a huge moving Elk (After the 0/4 Camel was previewed, I told a WotC employee that they should’ve had a real camel there too). That’s not out of place at this convention. WotC held the World Championship for the Pro Tour, which finally makes sense; now it’s right before a block rotates instead of at the end of the year when a new block has been in Standard for two months. The grand Paramount theater housed a variety of panels that you could watch both live and streaming live. If you didn’t want to watch what was happening onstage, you could spellsling with WotC employees and celebrities, play in numerous drafts, play Commander, Cube, or just the basic learn how to play this game all within the same building. There was merchandise sold in the lobby (with a surprising amount of variety of what to choose from), as well as a prize wall for those of you played in sanctioned drafts. If you didn’t want to leave the Magic area for four days you didn’t have to. I used to come to PAX because Magic was a part of it. It was something that I would do near the end of the day because of the party. Now, I go to PAX because Magic is there and I almost ignore the rest of the convention. Sure, I walked around once in the indie section and played a game in the Jackbox section, but PAX has lost its luster when it’s not Magic related. Maybe it’s because I feel it’s my duty to try and give you what it’s like while I’m there (I did a Parascope of the Inventor’s Fair). Or maybe WotC is just winning PAX. This was the big new thing and it was a gamble for WotC. Our Inventor’s Fair was a row of tents outside the gaming area where people could experience Kaladesh and grasp the type of plane that they’re introducing. For the past year, we’ve returned to two planes both under siege from the Eldrazi. It was a conscious decision from WotC to have a bright cheery plane to go to next as well as make this different from Mirrodin. 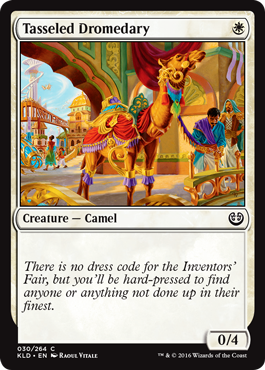 To put on an Inventor’s Fair (just like in the story) was a brilliant piece of marketing (because, let’s be honest, all of this is marketing). It felt much different than any other plane we’ve been to, including Ravnica (which was my fear). The tents were, in pretty much the right order: A meet up area to meet Magic celebrities, build your own Thopter (the same ones we’ll now get in our prerelease boxes), a store to buy MTG merchandise, a jewelry demo, a glassblowing demo, temporary tattoo parlor with spray paint, a space to learn how to play Magic, a DJ booth, and a bunch of standup tables to play Magic outside right next to the food trucks. Also, there was a glass case full of Kaladesh artifacts, the 15 foot tall aether driven elk, giant preview cards, tons of WotC people, and Chandra and Sahelli (Cosplayers Christine Sparnkle and Makeup Siren respectively who were these two characters). The Inventor’s Fair was a nice addition to PAX that certainly added the needed flavor of the plane to kick start us for the next 6 months. It’s a little odd that the story card is also an Inventor’s Fair as well but I don’t think that played into the decision of it being a story beat. For the amount of people playing the game vs the number of people there at PAX, I don’t think there’s a story reason for PAX to have a huge impact on the storyline. While we won’t have anything at PAX West to show for Amonkhet (hopefully PAX East), I think this is a very nice stepping stone for building even a larger impact at PAX for next year. Something new this year was that WotC invited content creators from all over the world to come to PAX to report and to make more content. Part of the show/spectacle is not only for people there at the event but also for the people to report back about the spectacle (remember, this is a marketing tool as well and what I was doing years ago). But this was a great way to get the community involved with different areas of content creation. There were streamers and YouTubers and Tumblrs and other social media people. But they were all fans of the game, which is key. You want the people who are passionate to come to this event as this is a convention for the fans of games, not just the press like E3. I was fortunate to meet The Professor from Tolarian Community College and Meghan from Magic: The Amateuring, and Denis from Windmill Slam. While I only spent a few minutes with The Professor and Meghan (They were working on their preview videos: Here and Here respectively), I was able to enjoy a nice Chaos Draft with Denis (Chaos drafts were happening all weekend); it was one of my favorite times drafting ever (as well as only playing one game per match, which was interesting). Denis hosts my favorite Magic: The Gathering game show: Windmillionaire. I may be slightly obsessed. Go, watch a few episodes and enjoy the chaos of the show. So I acted a little fanboyish when we met (even a little more when I was talking to him on Twitter before we met). WotC flew him out and gave him a chance to do his gameshow here at PAX (I can’t wait for that video). Spending time with him was a blast and I wish him all the best of luck. With our draft winnings, we were able to get me a Consulate pin (only available at the Prize Wall and not for sale), and him a Commander deck, his first Commander deck. It was a win/win for everyone involved. But bringing people from the community to report on PAX and describe it in their eyes is what WotC should be doing. GP’s, Pro Tours, nothing that WotC does is quite like PAX and to have these content creators go back and tell their fans “Hey, WotC’s pretty cool and here’s all the info coming out about the new set and this is why you should be excited,” is great marketing (Assuming that A) WotC was pretty cool and B) you should be excited for the set). The one thing I wish was a little better was the to have the Community Ambassadors intermingle with the people there at PAX and draw attention to them other than just telling people online. If you didn’t recognize them, then they just seemed like other Magic fans roaming the areas. This is where the loss of the party hurts a little bit because it would’ve given a great platform to introduce them to a bunch of people. It doesn’t even really help if they wear a t-shirt with their logo or playmat because a fan of theirs could’ve supported them and bought it. Maybe this is something to think about for next year. The theater that WotC was in for five days was just amazing. If you get a chance to visit the Paramount in Seattle, I would suggest you go. The amazing woodwork of the main theater walls and ceilings did help transport us into the world of Kaladesh as it completely played into the design of the world. It was large enough for everything they wanted to do. The main floor was separated into the stage and their audience, and the play area. It gave the impression of two distinct areas while being in one large room. The only complaint I had was if you wanted to pay attention to anything on stage you had to be in the seating area right next to the stage or the balcony above the floor. When the Top 4 for the World Championships were announced, I had to walk all the way to the front section just to hear the names. I get why they did it (to allow the play area to focus on gaming), but it would’ve been nice to bring some of that excitement to everyone in the room. To be fair, I wasn’t there at the opening/closing shows where they might have done just that. The other main section past all the merchandise (which was the largest amount of Magic related merch I had ever seen in my life, bravo for finally selling things we want including the new Gremlins from Kaladesh as plush die bag holders), was the learn to play room. Now, WotC has always had a learn to play area which is perfect. That room was always full and I believe it was the wonderful organization of the Lady Planeswalkers teaching people to play. If I could get my hands on of of those six foot playmats they used, I would love to. The issue here was the art they featured in the area. I’m not going to say that this art was “wasted” on new players, but every single art in this panorama was new art from Kaladesh. This was the only place to see this art, above the tables of new players learning how to play far from anyone who wanted to get a good lok without interrupting people learning the game. If I wasn’t filming the general area, I wouldn’t not entered the “Learn to Play Magic” area as that’s not directed at me. There was no real good way to look at the new art that I’m sure everyone who is an enfranchised player would have loved to see. The most popular tweets I had over the weekend involved me tweeting these pictures out. Players there had no idea they were even there. While I’m not as much of an art aficionado as Mike Linnemann, it would’ve been nice to see these on display somewhere else as well. The panels were all pretty well done. It looks like the panelists weren’t bored out of their minds for the most part and they all seemed rather well received. If you have a favorite sub-interest in Magic, they had a panel for you. The bonus part was streaming it live and having the archives available online. I was there for the Card Creation panel and it was a fun insight into how a card might be created. Obviously they skipped a bunch of steps and there was little development, but it was fun to design something with actual WotC people. Rules Manager Matt Tabak even said we were WotC interns for 12 minutes, so I’m going to milk that for as much as I can. The beginning and end shows were fantastic (I streamed them so that was my experience), but they were a huge step up from production from last year’s show. Keep it up. The one area I was surprised to see nothing of was the digital side. I know I didn’t see anything related to Magic Online, but I don’t think I saw anything talking about Magic Duels or Magic Puzzle Quest. They may have been in the main hall at a WotC booth, but they should’ve been here, especially in the new player’s area. There have been Magic Online events in the past at PAX, so to see nothing from them took me a back a little. There looked like there was enough room on the open floor for a pod of eight for drafting. The computers/logistics might have been too much though. Maybe instead of the DJ Booth in the Inventor’s Fair there should have been demos of Magic Duels and Puzzle Quest; a quick “download this for free” idea for the people walking by to get them interested in the property. Hey, it’s worked for Pokemon Go. I’ll hold my thoughts for another post when the full set is released. But what we’ve seen of it now is fantastic. I love the tone of the new plane, the art is some of the best ever, and as a Johnny, I love all the building possibilities this creates (why can’t a non-artifact plane be Johnny as well). All of the WotC employees were excited by the set, like really excited. WotC doesn’t have a booth where you wait three hours in line to play a ten minute demo of a game. What they put on during PAX is an embarrassment of riches. If if feels like I’m complaining about something it’s not because I hate it, but I want the experience to be as best as it can be for all those involved and help grow the brand. The more the brand grows, the more players we have, the more unique voices we hear and the better we can get as a community. Two of my other favorite CCGs, Dice Masters and Spoils, don’t even show up at PAX while WotC has an entire theater just for one product. Magic is doing their own thing and it’s working. I honestly wish that everyone would get to experience PAX at least once. This is what I imagine the Pro Tour should be, minus the 15 foot tall elk. This is a huge party and everyone gets together to celebrate the game we all love. I finally got to meet people that I’ve only talked to on Twitter, put a face to a name and an avatar. And because we’re not all pros, it’s easier to talk to someone here and get a game of Commander going. You can still gush over Magic celebrities and say hi and get them to autograph something. That’s what this event is for. To say “I wonder how WotC is going to top themselves next year,” is a silly question to ask anymore. It’s always funny when I see reviews of concerts because that seems like a very “in the moment” type of thing to review as you can’t experience that again. “Music was good, band interacted well with the audience, t-shirts were a little overpriced, bad parking.” Tweeting from PAX was most likely the best way I give you the experience of being there. If you were ever on the fence of heading to PAX (much like if you were on the fence of seeing said band again), hoping this can give you the push in the direction of going. Magic is celebrated here for four days, you can join in on the fun. Prereleases and Pro Tours are one thing.